This is how deceivers operate – they lie and cheat and steal by whatever means possible to warp the truth. They are the world’s hypocrites and fraudsters pretending to be the righteous, but the righteous recognize them as false. The problem is that American law doesn’t do enough, and that, too, is because of Democrat corruption deliberately not upholding our laws! These protester/rioters should be in prison! These pretenders threatening Republicans in town halls posing as Trump voters likewise! There’s free speech, and then there’s the lying snakes in the grass that comprise the Democrat Party. These are the people that President Trump hopefully recognizes that he will not ever be able to work with or allow any kind of input or control in his administration. If he ever takes advice from a Democrat then he will suffer the humiliation of Bush 41 who listened to Democrats who advised him to raise taxes and then hanged him on it in the next election. What could derail Trump’s agenda? There is such an incredible amount of propaganda and lies being thrown around by the media that it is impossible to keep up to warn you all about it. All that can be said is to exercise your good sense and what you know to be righteous and true. The Left wants to destroy America, not work with the Right to make America better. Republicans who foolishly “reach across the aisle” are reaching out to those who hate and revile them with all the venom of pit vipers who will happily take them out first chance they get. Democrats in Congress are not angry with Republicans – they are enraged at the American people for taking away their power. Leftists across the nation are incensed and insane to reap vengeance on those who denied them absolute power over their lives. Trump Derangement Syndrome is reaching such fevered epidemic levels that the elites on the Left are becoming concerned it may become too much and alert people to their poisonous nature. Rush Limbaugh nails it when he says, “The Left’s religion is liberalism.” Before they are anything else they are liberals first. That is why they openly bash women, gays, and blacks who stand against them despite claiming to be champions of their causes. America is the exception in history. We established a nation governed by the people. We spilled our own blood to end slavery. We fought wars to free other nations from tyranny. Yet the Left reviles us for doing so! They create frauds like man-made global warming to milk us of our money claiming America’s CO2 pollution will destroy the planet. The Chinese burn copious amounts of coal and all that CO2 goes out over the Pacific where it is causing algae blooms. The Earth’s ecosystem takes care of itself, but leftists don’t want you to understand the science of that. Instead they say there are record high temperatures even as the polar ice caps grown. Scientists have no idea what caused and ended the Ice Ages. But liberals pretend that they do. They could have claimed the “Pause” in global warming was their doing rather than a fraud. But that would have caused their fear-mongering to wane. Likewise, they try to turn attention from the real threat to America from Islam the ultimate socialist ideology. Under Obama hundreds of jihadi attacks in America have either gone unreported or misreported as simple assaults or erroneous murders like the Oklahoma beheading as “workplace violence.” Meanwhile, those who practice Sharia in America are waging Jihad on Americans. They call Trump’s travel restriction a Muslim Ban, which it is not. The Left will say we cannot ban a religion because it violates the 1st Amendment. We don’t need to ban Moslems, but we MUST BAN SHARIA LAW! Sharia is Islam, the laws of Muhammad, and it is not religion, but government law, and THAT IS NOT COMPATIBLE WITH THE CONSTITUTION! Those leftists who are arguing to allow Sharia law to rule in America fight tooth and nail against Canon Law being used, so they have no leg on which to stand. BAN SHARIA should be American’s battle cry! Anything and everything liberal Democrat leftists say and do is a lie meant to deceive and destroy their opposition. Don’t be taken in by those who are false, deceitful, and hypocritical. Whenever a leftist accuses someone on the Right of being a hypocrite, learn the facts. Lies are facts, not truths. The Left cheats and can succeed until the people open their eyes and ears to learn the truth that the Left is NEVER right! This entry was posted in Politics and tagged America haters, Climate change, Constitution, Democrats, Donald Trump, Islam, Leftwing Radicals, Liberal media propaganda, Liberalism, Obama's Black Flag Army, Republicans, Sharia, Socialism. Bookmark the permalink. 17 Responses to Stop fooling yourself; the Left wants America destroyed – BAN SHARIA! The leftists never explain how Muslims in the Middle East have 1st Amendment rights. They don’t. If my parents, who were anchor babies, don’t, they don’t either, because the Muslim immigrants aren’t even here! I get *so* tired of this 1st Amendment B.S, pretending that Muslim immigrants have rights that they don’t. Sharia Law is already against the law. It is just not enforced. Rather than wait for Jeff Sessions, which both McConnell and Schumer will stonewall, how about just removing the funding for these so-called sanctuary cities? That’ll put a stop to this as many of them depend upon Big Brother for as much as half of their budget. Nice rant. Too bad the disconnect from reality is glaringly obvious. Try to be more subtle in your insanity if you want anyone to take it seriously. This is what happens to people who only get their news/opinions from Rush Limbaugh and Faux News. People are entitled to their opinions, but facts are facts no matter what you believe, or refuse to accept. I love it when liberals think that just saying someone is wrong proves them wrong. If my “disconnect from reality” is so “glaringly obvious” you should be able to refute just one little non-fact. But you can’t, so you just call people names hiding behind implication and innuendo. I could easily refute 90% of this horse wallop. But I know my time would be wasted on the likes of you. The facts are out there. How about you do some research of your own? Riiiiigggghht! It’s so easy and yet you can’t even take one minute to make just one example. But you can spew your ignorance by claiming I’m ignorant and should be the one who should learn something. I already did and I spelled it out. I rank your “counter-argument” up there with the “I know you are, but what am I?” – nanny nanny boo boo defense. Every negative thing you wrote about “liberal Democrat leftists” could be said about the party you support. It all depends on one’s perspective. I urge you to take your own advice and “exercise your good sense” instead of allowing others (e.g., Rush Limbaugh, Jihad Watch, Dustin Koellhoffer, etc.) to influence your perspective. Suggest you take your own advice: Don’t be taken in by those who are false, deceitful, and hypocritical … learn the facts. Speaking of facts, your “hero,” Rush Limbaugh is much more an “entertainer” than a bona-fide reporter. His tirades are by far based on personal opinion rather than fact (see http://www.politifact.com/personalities/rush-limbaugh/). This is exactly why I and Rush and people like us URGE EVERYONE to learn the facts for yourself. You say, “Rush Limbaugh is much more an “entertainer” than a bona-fide reporter.” He has NEVER SUGGESTED he is reporting news, but is presents his own opinions in as an entertainer. It is you who sees what is not there. Rush always presents the liberal’s perspective and then easily tears it apart because it is always wrong. There is no deception when all the facts are brought to light and good sense applied. You say, Rush always presents the liberal’s perspective and then easily tears it apart because it is always wrong. I’m curious. Do you ever watch Anderson Cooper on CNN? Instead of just ONE man offering his opinion, you will find anywhere from 3 to 6 (and even more at times) discussing the political scene. And more importantly … this group INCLUDES one or two who support and defend tRump and his ideology. IMO, this is far more balanced reporting than one individual who is known for his “anti-liberal” views trying to present a balanced perspective. Of course. I’ve seen all the talk show hosts make their cases. I don’t look at every single one over every issue, but I know how it goes. I have found that discourse that uses several people generally makes a mess of things as one person can present multiple untruths that cannot all be refuted by one person in the time they are allotted. The result is that lies spread. I also don’t like it when the moderator has two guests on and one talks over the other so their points cannot be heard. It’s always best when debaters are forced to remain silent while the other speaks and then make their case. The last problem is that often moderators invite people who cannot make their case coherently in the time limit. I also dislike moderators who allow lies to be told but when the truth is thrown back at them they silence the debater. There are too many leftists who present their lies as the truth, present their false premise as fact, and then demand the conservative debate on their terms. To understand this you first have to know both sides of an argument and the facts behind the debate. That is how so many are easily fooled by the false premise they are presented such as “Comey sabotaged Hillary,” or “Trump fired Comey to stop Russia investigation.” There is no factual basis for these allegations, only assumptions, implications, and innuendos. There are too many conservatives who present their lies as the truth, present their false premise as fact, and then demand the liberal debate on their terms. 😀 From the liberal perspective the conservative lies. 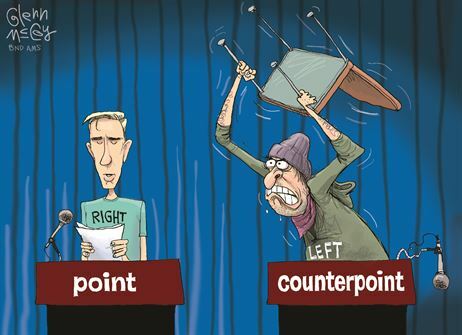 But when the two debate the facts they know the leftist always finds themselves on the losing side. That’s why you are spending all of your efforts debating me on the definition of truth rather than actual facts. 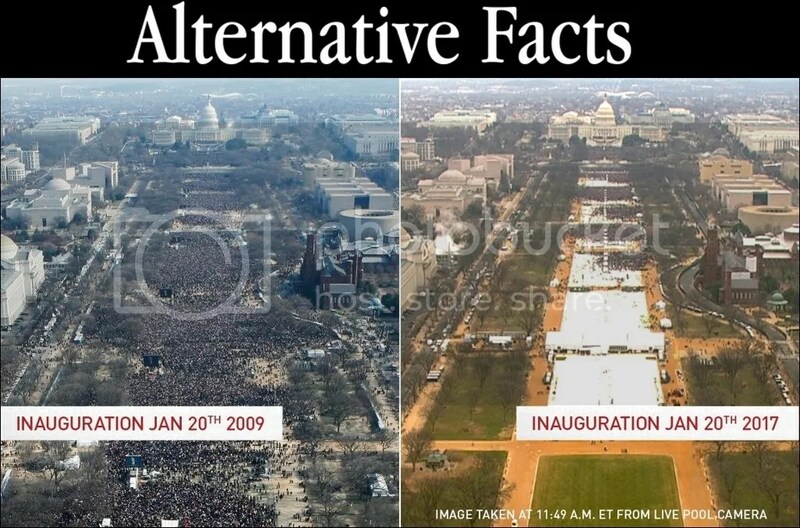 Yours is the world of false images as examination of the photos and the times they were taken reveals that the leftist who produced these used Obama’s photo from the height of his inaugural ceremony, while he used an early morning photo from Trump’s before the crowds all arrived. You should learn to do some research before you make a claim based on anything a leftist says is the truth. Just found your website, and like what I see. Very thorough and thoughtful, unlike the Antifa-style punks who have nothing but expletives to back up their false narratives. It’s really sad how the Left has so harmed America’s youth by depriving them of a proper early education while filling their heads with radical nonsense.